Indulge yourself in a 4 day fully supported point to point ride across the cycling Mecca of Mallorca. In small guided groups explore different areas of the island fully supported with guides luggage transfers in our vehicles, mechanics, food, and accommodation plus specialist cycling tutorials in the evenings. Arrive into Palma, Mallorca. Single transfer Palma airport to Puerto Pollença 45 mins. Set up of bikes, have lunch and briefing. Depending on flight times, there are 2 ride options. In the evening there’s a chance to gain some extra bike knowledge with tutorials from leading experts. Dinner and accommodation in the Pollenҫa Club Resort. Leaving the hotel behind us we make our way inland with the objective of crossing the island and reaching the south west corner and the tip of the Tramuntana mountains. We head through the coastal flatlands and into the foothills on the south eastern side of the Tramuntana range, over the Col d’Honor and through the village of Orient. Dinner and accommodation in Valldemossa. This is a stunning day with everything you would expect from a mountainous Mediterranean island – short sharp hills and long demanding ones. We head off southwards on a winding coast road, then head further south to the very picturesque upmarket resort of Port Andratx. 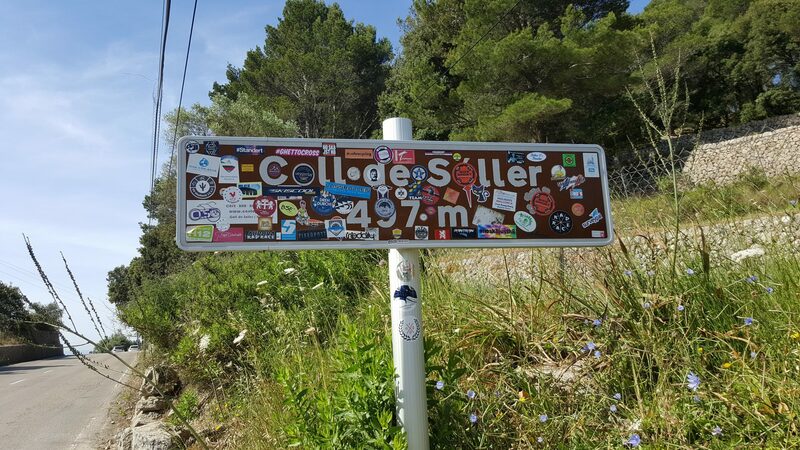 We then head north on the coast road before it dips to the south to pick up the traffic free climb over the Coll de Soller at 497m to enjoy its many hairpins. Dinner & accommodation in Palma. Day 4 is the climax of our 4 days riding. 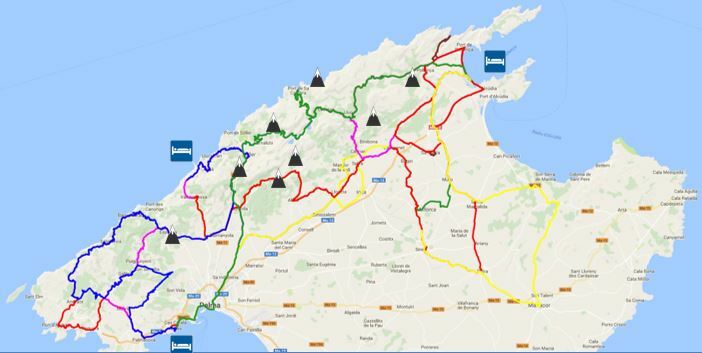 The route out of Palma is a steady uphill of over 1000m climbing. 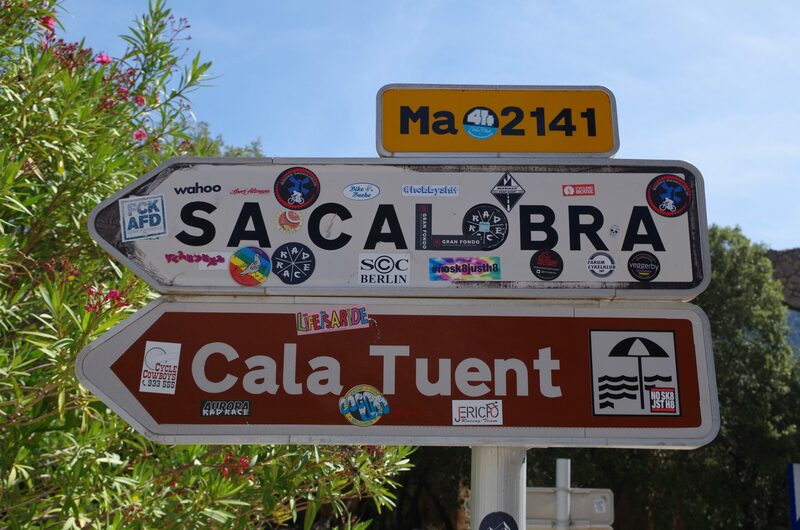 For those that need hairpins, the road (down) to Sa Calobra beckons. The descent is beyond description – 12kms of hairpins, switchbacks, 360 degree turns through tunnels, fast straights and chicanes with a descent (to nowhere) and consequent ascent, of 800m. Continue to the bustling town of Pollenҫa before finally arriving at the lovely seaside resort of Port Pollenҫa and back to our start hotel. Dinner and accommodation. Free day to relax and enjoy the hotel facilities until the transfer to the airport. Possible ride today if flight times allow. There are no flights to/from Mallorca included in the price. Once we know the event is going ahead we will advise recommended flight times for you to book in order to meet the group transfer. Both routes are fully supported with guides at a ratio of one guide to 10 cyclists, support vehicles, tour leaders/drivers. Each day you will get breakfast at the hotel before setting off, morning and afternoon refreshment stops while on the ride, a substantial lunch plus dinner and twin room accommodation each night. While riding, water, gels and electrolyte tablets are available from the support vehicles along with tool kits to help make even the slightest adjustments to your bike. The event is a guided ride with groups being led by pie guides who are familiar with the terrain and who help all abilities complete the trip. In an age where independence rather than group cycling is heralded, those not familiar with the pie guiding system may be reluctant to follow rather than lead. We have set up a Strava “club” for the Mallorca Crossing the Island bike ride. The link will be sent to you when you sign up. If you have already got a personal Strava account you can just log on using the link we will send, join the Mallorca Crossing the Island “club” and start your training with other cyclists. If you haven’t got a Strava account, simply enter your details in the “Sign Up for Free” section on Strava. Don’t be daunted by the leader board and other people’s fast times-just use Strava as your training tool. First option is to pay £250 deposit by cheque or BACS (please contact us for details: tina@pieevents.co.uk). The balance of £700 is payable by cheque or BACS by 26th July 2018. If you are signing up 10 weeks before departure or less, please pay the £950 in full. Discounts for groups of 10 or more. Minimum total numbers apply. For more details contact Tina Makin on tina@pieevents.co.uk.